Scroll down through these Dark Energy Detectives case files, and you’ll see beautiful images of galaxies taken with the Dark Energy Camera. While they come in different shapes, sizes, and colors, these galaxies all have one thing in common: they’re all speeding away from our own Milky Way, at speeds of tens to hundreds of millions of miles per hour. The Universe is expanding, something we’ve known for nearly 90 years. If we could track the speeds of each of these galaxies over time, what would we find: would they stay the same, speed up, or slow down? Since the Milky Way’s gravity tugs on them, Isaac Newton would have told us they would slow down over time, just as an apple thrown straight up in the air slows down (and eventually falls) due to the pull of Earth’s gravity. But Isaac would have been wrong, the galaxies are getting faster, not slower. The expansion of the Universe is speeding up, something we’ve known for only 17 years. The 300 detectives of the Dark Energy Survey (DES) are embarked on a five-year mission to understand why this is happening. In this quest, they’re carrying out the largest survey of the cosmos ever undertaken. While these goals sound lofty and profound (and they are), at its core DES is really about taking pictures. Lots of them. On a typical night, DES detectives snap about 250 photos of the sky. After five years, we’ll have over 80,000 photos in our album. For each snapshot, the camera shutter is kept open for about a minute and a half to let in enough light from distant galaxies. On each image, you can count about 80,000 galaxies. When we put them all together, and accounting for the fact that we’ll snap each part of the sky about 50 times, that adds up to pictures of about 200 million galaxies, give or take. One of the ways we’ll learn about dark energy—the putative stuff causing the universe to speed up—is by measuring the shapes of those 200 million galaxies very precisely and comparing them to each other. Imagine taking photos of 200 million people, roughly one out of every 35 people on Earth, to learn about the diversity of the human race. To gain the most information about our species, you will want all of your photos to be taken by a professional photographer under identical conditions conducive to getting the best image: good lighting, camera perfectly in focus, no jiggling of the camera or movement of your human subject during the exposure, etc. But inevitably, with 200 million photos, given the vagaries of people and circumstance, some photos will come out better than others. In some, the subject may be a bit blurred. In others, there may be too much or too little background light to see the person clearly. In the Dark Energy Survey, we’re striving to get the best, clearest snapshots of these 200 million galaxies that we can. As professional photographers of the night sky (a.k.a. astronomers), we’re using the best equipment there is—the Dark Energy Camera, which we built ourselves—to do the job. The camera has 570 Megapixels and 5 large lenses. It has a sophisticated auto-focus mechanism to always give us the crispest images possible. No need for a flash, since galaxies burn with the light of billions of suns. But as with human photography, Nature doesn’t always cooperate. The Dark Energy Camera is mounted on the Blanco telescope, located at Cerro Tololo in the Chilean Andes. This site has mostly very clear nights, but occasionally, clouds roll by. Turbulence in the atmosphere, which makes stars twinkle, leads to a slight blurring of the images of stars and galaxies, even if the camera is in perfect focus. The camera works by taking pictures of all the light that reflects off the 4-meter-diameter mirror of the telescope. If a cold front moves through, making the air in the telescope dome cooler than the 15-ton mirror, plumes of hot air rising off the mirror lead to blurry images. The sharpest images are those taken straight overhead—the further away from straight up that we point the telescope, the more atmosphere the light has to pass through, again increasing the blurring; since our survey covers a large swath of the sky, we cannot always point straight up. Strong wind blowing in through the open slit of the dome can cause the telescope to sway slightly during an exposure, also blurring the picture. Since the Earth rotates around its axis, during an exposure the massive telescope must compensate by continuously, very smoothly moving to stay precisely locked on to its target; any deviation in its motion will—you guessed it—blur the image. For all these reasons and others, the quality of the DES images varies. On some nights, conditions conspire to give us very crisp images. On others, the images are a bit more blurred than we’d like, making it harder to measure the shapes of those distant galaxies. If an image is too blurred, we don’t include it in the album: we’ll come back another night to take a photo of those particular galaxies. So far, about 80% of the photos we’ve taken have been good enough to keep. Most nights during our observing season, we have three detectives operating the camera; each of us is there for about a week, and in the course of a season about 50 detectives rotate through, taking their “shifts.” On the night of January 27, 2015, I was in the middle of my week-long observing shift at the telescope with two fellow detectives, Yuanyuan Zhang from the University of Michigan and Andrew Nadolski from the University of Illinois at Urbana-Champaign. That night, Andrew was manning the camera, I was checking the quality of the images as they were taken, and Yuanyuan was our boss. The conditions that night were outstanding. Although it was a bit humid, the atmosphere was extremely smooth and stable. We were mainly taking pictures using filters that let in only very red or near-infrared light. This was because the moon was up, and the moon is actually quite blue: red filters block most of the moonlight that scatters off the atmosphere from entering the camera, enabling us to see red galaxies against the dark night sky. In his famous photograph “Monolith, the Face of Half Dome” taken in Yosemite National Park, Ansel Adams used a red (but not infrared) filter to darken the blue daytime sky to dramatic effect. At 12:28 am local time, we snapped exposure number 403841, using a near-infrared filter called the z-band. The z-band is so red that it’s beyond the visible spectrum that can be seen by the human eye, but digital cameras, and the Dark Energy Camera in particular, are very sensitive to near-infrared light. Computers at the telescope analyze each image right after it’s taken and display the results on a bank of monitors, so we can tell whether we’re taking data that passes muster for our cosmic album. When 403841 came out, the screen showed that it was an exceptionally sharp image. Further analysis convinced us that it was in fact the sharpest image of the roughly 35,000 snapshots that DES has taken so far, going back two years to the beginning of the survey. The image was so sharp that the light from each star was spread out over only about 0.6 seconds of arc or about 0.00017 degrees. For comparison, that’s how big a crater a kilometer across on the surface of the moon looks from Earth. It’s also the angular size of a typical human hair seen at a distance of about 100 feet. A small portion of the 403841 image is shown above in false color, showing a great spiral galaxy plus a number of smaller, fainter galaxies and a few bright stars in our own Milky Way. 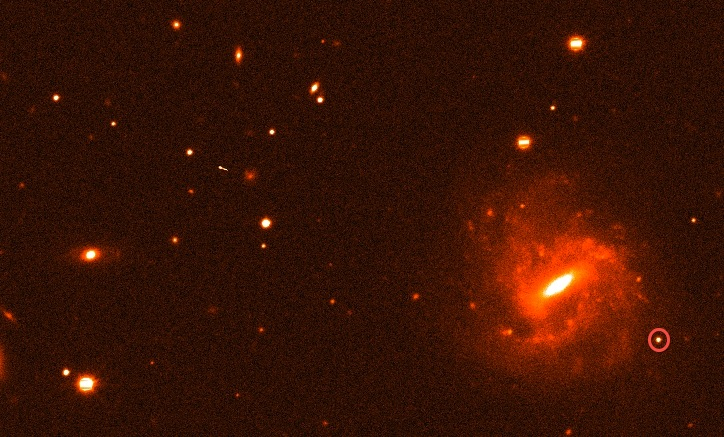 The star inside the red circle at the lower right of the image has its light spread out over only 0.6 arc seconds. While not as pretty as the color images of galaxies in other DED case files, this is closer to what a raw image directly from the camera looks like. The raw DES digital images are sent for processing to the National Center for Supercomputing Applications in Urbana-Champaign, Illinois (if you’re under 40, ask your parents if they remember sending film out for processing), to make them science-ready for our fellow DES detectives. In DES, we keep a “bragging rights” web page of the sharpest images we have taken in each of the five filters we use. Our friend 403841 is now prominently displayed there—the best of the best. But the best thing about records is that they’re made to be broken. N.B. : we just completed a Reddit AMA on Friday, Jan 30, where we discussed the cases and evidence for dark energy and dark matter. En lo más profundo del cosmos, entre las fuerzas oscuras y las energías que le dan vida, arde una llama sobre la que cuece… un caldo. La historia de la expansión del universo está dominada por la materia y la energía oscura. Sin embargo, son los elementos cotidianos de la tabla periódica los que nos permiten estudiarlo y entender su historia. En esta entrada os proporcionamos una pizca de las ideas sobre cómo comenzó su existencia esta sopa cósmica de elementos. Casi todos los elementos se crearon en la primera media hora tras el Big Bang. El potaje resultante resultó más bien soso: nueve núcleos de hidrógeno (un protón) por cada núcleo de helio (dos protones) y casi nada del resto. Incluso rebuscando entre mil millones de núcleos, tendrías suerte si encontraras algún sabroso litio de tres núcleos. Afortunadamente, en los 13700 millones de años posteriores, las cosas se pusieron un poco más interesantes. La fusión nuclear, tan difícil de reproducir en la Tierra, es habitual en las estrellas. Gracias a ella existe el carbono de nuestras células y el hierro de nuestra sangre. El sabor, densidad y temperatura de esta sopa de elementos varía considerablemente. Pensad en nuestro propio Sistema Solar: desde las presiones y temperaturas extremas del núcleo del Sol, hasta el frío vacío interplanetario. Estas variaciones se repiten por toda la Vía Láctea y en el resto de las galaxias. Estos tres hechos, que la mayoría de los elementos se crearon poco después del Big Bang, que el universo se enriqueció después y la enorme variabilidad de condiciones para dichos elementos, suponen una gran ventaja para el proyecto Dark Energy Survey. Tomad como ejemplo los cúmulos de galaxias, como los que aparecen en la presentación que encabeza esta entrada (y descritos con más detalle más abajo). Estas estructuras son tan enormes, que pueden considerarse “mini-universos” por derecho propio. Los cúmulos contienen varias docenas de galaxias, a veces cientos. Entre ellas existe un velo de gas tenue. Tanto el gas como las galaxias están atrapadas dentro de los confines del cúmulo por la materia oscura. Podría decirse que la materia oscura actúa como la tapa de una cacerola. Así como la tapa evita que se evapore todo el agua, la materia oscura evita que las galaxias, muchas de las cuales se mueven a más de un millón de kilómetros por hora, se dispersen. Sin embargo, en las fronteras de los cúmulos de mayor tamaño, la energía oscura empieza a competir seriamente con la gravedad, y algunas de las galaxias se ven arrancadas de su cúmulo original. Esta competición entre energía oscura y gravedad a estas escalas es lo que convierte a los cúmulos en magníficas sondas para explorar la energía oscura. Las partículas de gas se hallan tan calientes que los electrones (cargados negativamente) y los núcleos (cargados positivamente) se separan convirtiendo el gas en un plasma. Éste brilla con intensidad en la zona de los rayos X en el espectro electromagnético, que puede ser detectado por satélites como XMM-Newton y Chandra. El plasma también crea una sombra en el Fondo Cósmico de Microondas (el pulso de luz emitido en todas direcciones unos pocos cientos de miles de años después del Big Bang), de manera que también puede detectarse por radiotelescopios como el South Pole Telescope. Por contra, los elementos atrapados en las estrellas se hallan mucho más fríos, y a densidades muy superiores, y brillan con fuerza con luz visible. La luz de las estrellas no sólo permite detectar cientos de miles de cúmulos, sino también medir la distancia a los mismos (a través de una técnica conocida como desplazamientos al rojo fotométricos), y hacer estimaciones preliminares de sus masas. Estos valores de masa han de ser refinados antes de poder usar estos cúmulos para hacer cosmología, y la información del plasma de los telescopios de rayos X y radio es esencial para eso. En la presentación de arriba mostramos varios ejemplos de los cientos de cúmulos registrados por el Dark Energy Survey que han sido observados también por el muestreo de cúmulos de XMM-Newton. La intensidad de la emisión del plasma caliente se indica con los contornos rojos. Los especialistas en rayos X trabajan con ambos conjuntos de datos (luz visible y rayos X) para calibrar las masas de los cúmulos del Dark Energy Survey. Por último, ¿por qué decimos en el título con “fundamento”? Bueno, resulta que “fundamento” es sinónimo de “quintaesencia”, y este es el término adoptado por los cosmólogos como palabra comodín para referirse a las teorías que permiten una variación en el tiempo en las propiedades de la energía oscura. Imagen: Detectives Phil Rooney [Universidad de Sussex] y Chris Miller [Universidad de Michigan]. Oculto sob um mar de luz, um padrão complexo sussurra e muda lentamente. Este é composto de forças cósmicas praticamente invisíveis. Nesse espaço que separa amontoados de galáxias jaz um espaço vazio e árido. Contudo, enquanto cada galáxia, com seus bilhões de estrelas, tem uma história única de nascimento e evolução, devemos tomar cuidado para não deixar de ver a floresta por conta das árvores. Tomado como um todo, o padrão de aglomerados e vazios em nossos mapas de galáxias podem nos dizer muito sobre as forças escuras que dão forma a nosso universo. Olhando a imagem da Camera da Energia Escura (Dark Energy Camera, acima), podemos ver um monte de objetos celestes, incluindo manchas de diferentes cores: azul, vermelho, e amarelo, muitas das quais são galáxias distantes. Pode parecer que elas estão distribuídas aleatoriamente no cosmo. Entretanto, astrônomos mapeando a posição de galáxias espalhadas ao longo de grandes distâncias verificaram que elas estão organizadas em estruturas, em padrões cósmicos que atravessam trechos do tempo e espaço muito maior do que o visto nessa imagem. A figura à direita, do Sloan Digital Sky Survey, mostra um mapa com milhões de galáxias. Essas galáxias parecem se aglomerar em nós e filamentos (áreas com muitas galáxias), deixando para trás espaços vazios (regiões com menos galáxias ou nenhuma galáxia). Algumas das estruturas filamentares se estendem por bilhões de anos-luz – 60 trilhões de vezes a distância entre a Terra e o Sol. Como qualquer bom detetive, não podemos ignorar um padrão. Como galáxias, separadas por bilhões de anos-luz, se distribuem nessa grande estrutura cósmica que vemos hoje? Parece que o “chefe” dessa operação cósmica é um conhecido amigo (e inimigo) dos terráqueos: a força da gravidade. Usando simulações feitas em computadores, astrônomos são capazes de investigar como a gravidade atua em tantas galáxias separadas por distâncias tão grandes. A Simulação Millenium, e outras como ela, mostram que uma distribuição inicial quase aleatória de matéria vai naturalmente se concentrar em filamentos e vazios através da atuação da força da gravidade. Quando comparamos estatisticamente os resultados das simulações com nossos dados (observações de muitas galáxias), os padrão encontrados são os mesmos: a influência da gravidade universo afora produziu essa grande estrutura filamentar, a qual é chamada, “A Teia Cósmica”. Mas qual é a importância disso para detetives trabalhando no Dark Energy Survey? Bom, ao que tudo indica, a força da gravidade tem um arqui-inimigo em seu objetivo de criar uma grande teia que atravessa todo o universo: a energia escura, uma força invisível que causa a expansão acelerada do espaço por todo o universo. Quanto mais rápido o espaço se expande e acelera, maior as distâncias que galáxias tem que viajar para formar filamentos e aglomerados. Se existe mais energia escura, a gravidade precisa de mais tempo para juntar galáxias, e a estrutura em forma de teia leva mais tempo para se formar. Se não existe energia escura, a teia é feita rapidamente. Ao estudar a velocidade com que a teia cósmica é construída ao longo do tempo, podemos revelar o quão forte foi a energia escura e se ela está ficando mais forte ou mais fraca. A batalha entre gravidade e energia escura, contada através da evolução de estruturas na teia cósmica, é chave para estudar a energia escura. De fato, a teia cósmica é especialmente importante para responder uma pergunta bem específica: será que existe mesmo a energia escura?!? A maioria dos astrônomos concorda que existe um grande número de evidências da expansão acelerada do universo. Por diversas razões, a fonte mais aceitável dessa aceleração é algum tipo de nova força ou de outra forma, de uma energia oculta, “escura”. Mas a principal teoria alternativa é a mudança das leis da gravidade (especificamente, das leis da Teoria da Relatividade Geral de Einstein). Já que físicos e astrônomos testaram exaustivamente as leis de Einstein na Terra, no Sistema Solar, e em galáxias, essa mudança só se manifestaria em escalas maiores. Isso poderia estar causando a aparente aceleração cósmica, de tal forma que não existiria realmente uma energia escura. Essa segunda hipótese rescreveria nossos arquivos sobre a teia cósmica. Talvez ao invés de uma luta contra a energia escura, a gravidade não tenha o mesmo efeito previsto quando observada ao longo de bilhões de anos-luz. Medidas dessa teia, em conjunto com outras da aceleração cósmica, são fundamentais para nos dizer se nosso universo é um campo de batalha para a energia escura e a gravidade, ou se a gravidade é simplesmente diferente do que pensávamos anteriormente. Seja qual for a conclusão (e quem sabe até uma mais estranha ainda) ela significa uma profunda revisão de nosso entendimento do funcionamento do universo. A medida que o Dark Energy Survey coleciona mais e mais belas imagens de centenas de milhões de galáxias ao longo de seus cinco anos de duração, nossos detetives vão analisar cuidadosamente suas posições, traçando a teia cósmica, na esperança de identificar que forças estão trabalhando na escuridão. Un intrincado y sutil patrón que cambia lentamente, acecha bajo un mar de luz. Se construye a partir de fuerzas cósmicas en la sombra, casi invisibles. Entre agrupaciones y marañas de galaxias yacen inmensos vacíos. Y mientras que cada galaxia, con sus miles de millones de estrellas, tiene una historia y evolución únicas desde su nacimiento, no perdemos de vista el bosque por culpa de los árboles. En su conjunto, el patrón de cúmulos y vacíos en nuestros mapas de galaxias puede informarnos acerca de las fuerzas oscuras que dan forma a nuestro universo. Mapeado de las galaxias con el Sloan Digital Sky Survey hasta dos mil millones de años de distancia. Los puntos rojos y verdes indican las posiciones de las galaxias, siendo los rojos los que indican una mayor densidad de galaxias. Los sectores negros en los laterales son regiones del cielo inaccesibles por el proyecto. Observando la imagen de la Cámara de Energía Oscura (arriba), vemos multitud de objetos celestes, incluyendo varias manchas azules, rojas y amarillas, muchas de las cuales son galaxias distantes. Podría parecernos que estas galaxias están distribuidas aleatoriamente por el cosmos. Sin embargo, los astrónomos que mapean sus posiciones a lo largo de grandes distancias, han averiguado que se hallan organizadas en estructuras de escala cósmica que abarcan inmensas regiones del espacio y el tiempo, mucho más amplias de lo que puede capturar esta imagen. En la figura de la derecha, del proyecto Sloan Digital Sky Survey, muestra este mapa para millones de galaxias. Éstas se acumulan en “grumos” y “filamentos” (zonas con muchas galaxias), dejando grandes vacíos entre ellos (con pocas o ninguna galaxia). Algunas de estas estructuras filamentarias se extienden a lo largo de miles de millones de años-luz, es decir, ¡60 billones de veces la distancia de la Tierra a la Luna! Como buenos detectives, no podemos ignorar un patrón como éste. ¿Cómo pueden las galaxias, separadas por distancias hasta miles de millones de años-luz, coalescer finalmente en estas grandes estructuras cósmicas que vemos hoy en día? La “mente” detrás de esta operación cósmica es un viejo amigo (y enemigo) nuestro aquín en la Tierra: la fuerza de la gravedad. Usando simulaciones por ordenador, los astrónomos investigan cómo funciona la gravedad entre tantas galaxias y a distancias tan enormes. La simulación Millenium y otras como ella, muestran que una distribución aleatoria de materia se acumula de manera natural en filamentos y vacíos a través de la fuerza de la gravedad. Cuando comparamos estadísticamente los resultados de las simulaciones con nuestros datos (observaciones de muchas galaxias), los patrones son los mismos: la influencia de la gravedad a través del universo visible ha creado esta descomunal estructura filamentaria, que ha sido denominada la “telaraña cósmica”. La simulación Millenium: las áreas más brillantes se corresponden a aquellas en las que existe una mayor concentración de materia y galaxias (puedes ver más sobre esta simulación en este vídeo). ¿Qué significa ésto para los detectives que trabajan en el Dark Energy Survey? Resulta que la gravedad tiene un némesis contra el que lucha en su objetivo de crear esta ordenada telaraña: la energía oscura, la fuerza invisible causante de la expansión acelerada del espacio en nuestro universo. Cuanto más rápido crece el espacio con esta aceleración, mayores son las distancias que deben viajar estas galaxias para formar filamentos y cúmulos. Si hay más energía oscura, la gravedad necesita más tiempo para atraer a las galaxias entre sí, y la telaraña se forma más lentamente. Si no hubiera energía oscura, la telaraña se construiría con mayor rapidez. Estudiando a qué velocidad se ha generado esta telaraña aprendemos cómo ha evolucionado la intensidad de la energía oscura, y cómo lo hará en el futuro. La evolución de la estructura de la telaraña cósmica es clave para entender la batalla entre la gravedad y la energía oscura y estudiar esta última. Sirve además para contestar una pregunta muy concreta: ¿existe siquiera la energía oscura? La mayor parte de los astrónomos está de acuerdo en que hay una evidencia aplastante para la existencia de la aceleración cósmica. Por varias razones, la hipótesis más plausible para explicar la misma parece ser una nueva fuerza o una nueva e invisible energía “oscura”. La alternativa más sólida es las posibilidad de que haya que cambiar las leyes que hemos establecido para la gravedad (concretamente, la teoría de la relatividad general de Einstein). Debido a que físicos y astrónomos han probado estas leyes en numerosas ocasiones tanto en la Tierra como en el Sistema Solar y en el interior de las galaxias, este cambio sólo podría manifestarse como un efecto a escalas mucho más grandes. Un cambio en estas leyes podría estar causando la impresión de que existe una aceleración cósmica si aplicamos la formulación incorrecta, de tal modo que no existiría la energía oscura. Esta segunda hipótesis re-escribiría nuestro caso sobre la telaraña cósmica. Quizás en vez de estar luchando contra una fuerza desconocida (la energía oscura), lo que ocurre es que simplemente la gravedad no se propaga de la manera que esperábamos, a grandes distancias. Las medidas de la telaraña cósmica, junto con otras medidas de la aceleración cósmica, serán claves para desentrañar si estamos ante un campo de batalla entre la gravedad y la energía oscura, o si simplemente la gravedad funciona de manera diferente a lo que imaginábamos. Cualquiera de estas conclusiones (¡o quizás alguna incluso más extraña!) supondrá una revisión fundamental de nuestras nociones sobre cómo funciona el universo. A medida que el Dark Energy Survey acumula más y más imágenes hermosas de cientos de millones de galaxias durante los próximos cinco años, nuestros detectives seguirán registrando cuidadosamente sus posiciones, mapeando la telaraña, esperando identificar qué fuerzas están actuando en la oscuridad. Lurking beneath a sea of light, an intricate pattern rustles and changes ever so slowly. It is built from dark, and nearly invisible, cosmic forces. Amidst the clumps and knots of galaxies lay empty, usually fallow spaces. While each galaxy, with its billions of stars, has a unique story of birth and evolution, we don’t miss the forest for the trees. Taken as a whole, the pattern of clusters and voids in our galaxy maps can tell us about the dark forces that shape our universe. Looking at the image from the Dark Energy Camera (above), we can see a plethora of celestial objects, including many blue, red and yellow smudges, many of which are distant galaxies. It may appear that these galaxies are randomly strewn about the cosmos. However, astronomers charting the locations of these galaxies across large distances have found that galaxies are organized into structures, into cosmic patterns that can span swaths of space and time much larger than what is seen in this image. 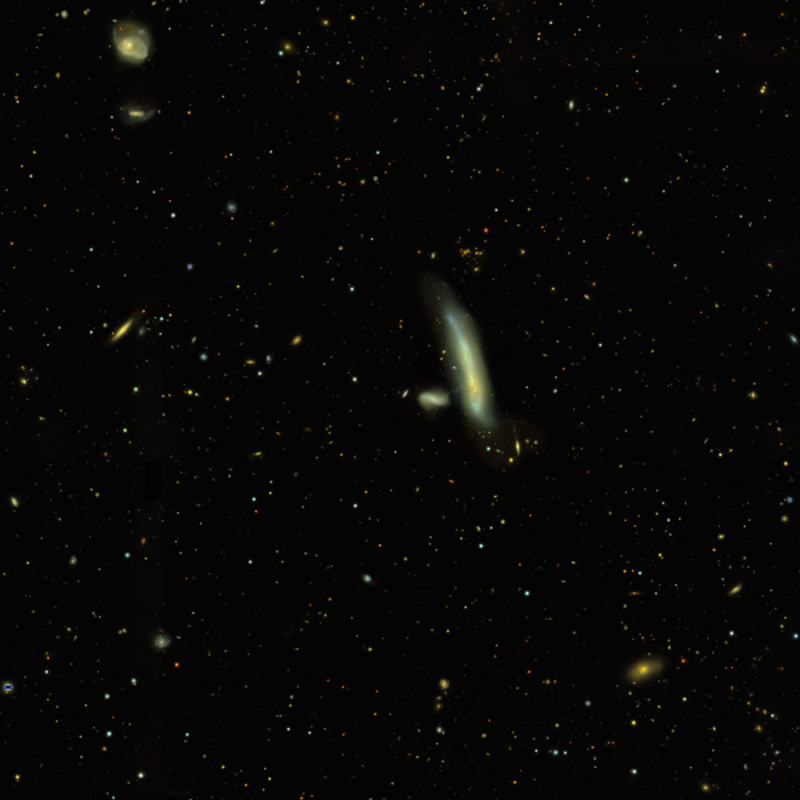 The figure on the right, from the Sloan Digital Sky Survey, shows a map of millions of galaxies. These galaxies appear to cluster into knots and filaments (areas with many galaxies), and leave behind voids (areas with few or no galaxies). Some filamentary structures stretch across a billion light-years – 60 trillion times the distance from the Earth to the Sun! Like any good detective, we cannot ignore a pattern. How do galaxies, separated by up to billions of light-years, eventually coalesce into the great cosmic structures we see today? It turns out the ‘mastermind’ of this cosmic operation is a familiar friend (and foe) to us on Earth: the force of gravity. The Millennium Simulation: brighter areas are where more matter and galaxies have concentrated. (See more of this simulation in this fly-through video). What does this mean for the detectives working on the Dark Energy Survey? It turns out that gravity has a nemesis in its goal for creating web-like order across the universe: dark energy, the invisible force causing the accelerated expansion of space throughout the universe. 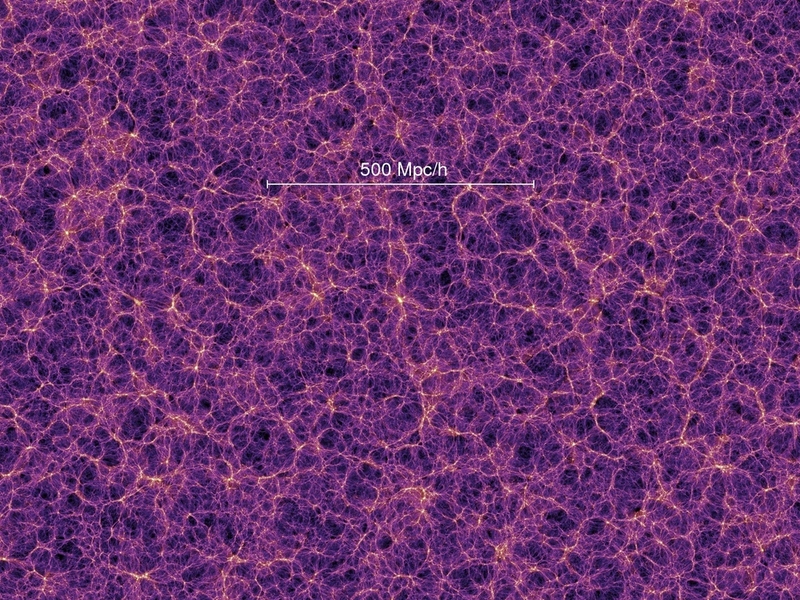 The faster space grows and accelerates, the greater the distances galaxies must travel to form filaments and clusters. If there is more dark energy, gravity needs more time to pull galaxies together, and web-like structure develops slowly. If there is no dark energy, the web gets built quickly. By studying how quickly or slowly the cosmic web was built across time, we learn how strong dark energy has been and if it is growing stronger or weaker. The battle between gravity and dark energy, manifested in the evolving structure of the cosmic web, is a key way to study dark energy. In fact, the cosmic web is particularly important for answering one specific question: is there even dark energy at all?! Most astronomers agree that there is overwhelming evidence for the accelerated expansion of the universe. For many reasons, the most plausible source of this acceleration is some new force or otherwise unseen, “dark” energy. The leading alternative theory though is a change in the laws of gravity (specifically, in Einstein’s laws of general relativity). Since physicists and astronomers have tested Einstein’s laws numerous times on Earth, the Solar System, and within galaxies, the change would only manifest itself at much larger distance scales. It could be causing the appearance of cosmic acceleration, such that there might be no dark energy. This second hypothesis would re-write our case file on the cosmic web. Perhaps instead of fighting against dark energy, gravity is just not carrying quite the influence across billions of light years that we’ve predicted. Measurements of the cosmic web, in conjunction with other measures of cosmic acceleration, will be key in telling us whether our universe is a battleground for dark energy and gravity, or if gravity is just different than previously thought. Either conclusion (or perhaps an even stranger one!) would signify a fundamental revision in how we think about the workings of our universe. As the Dark Energy Survey collects more beautiful images of hundreds of millions of galaxies over a five-year span, our detectives will be carefully logging their positions, charting out the cosmic web, hoping to identify what forces are at work in the dark.